On an icy day in January, 1961, in Bismarck, North Dakota, a sixteen-year-old boy walks home from high school with his best friend, Gene. The sudden sound of sirens startles and excites them, but they don't have long to wonder what the sound could mean. Soon after seeing police cars parked on their street, the boys learn the shocking truth: hours before, Gene's father, Raymond Stoddard, walked calmly and purposefully into the state capitol and shot to death a charismatic state senator. Raymond then drove home and hanged himself in his garage. The horrific murder and suicide leave the community reeling. Speculation about Raymond's motives run rampant. Political scandal, workplace corruption, financial ruin, adultery, and jealousy are all cited as possible catalysts. But in the end, the truth behind the day's events died with those two men. And for Gene and his friend, the tragedy is a turning point, both in their lives and in their friendship. Nearly forty years later, Gene's friend, a writer, revisits the tragedy and tries to unravel the mystery behind one man's inexplicable actions. Through his own recollections and his fiction--sometimes impossible to separate--he attempts to make sense of a senseless act and, in the process, to examine his youth, his friendship with Gene, and the love they both had for a beautiful girl named Marie. Spare, haunting, lyrical, SUNDOWN, YELLOW MOON is a piercing study of love and betrayal, grief and desire, youth and remembrance. 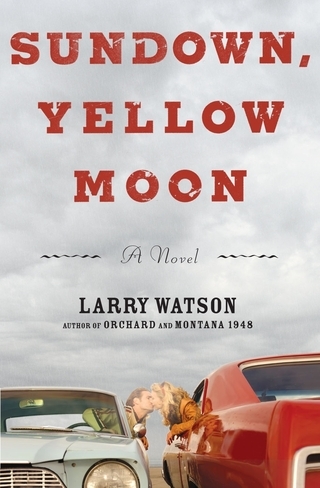 Using a brilliant evocative fiction-within-fiction structure, Larry Watson not only brings to life a distinct period in history but, most affectingly, reveals the interplay of memory, secrets, and the passage of time.